Wild pigs have been present in coastal South Carolina since they were released by the Spanish in the 1500s. Their historic range was geographically limited to floodplains of major river systems. In the mountains of the state, Eurasian wild hogs were introduced in the early 1900s. In the 1980s wild pigs were found in only 26 counties, with the distribution generally resembling their historic range. 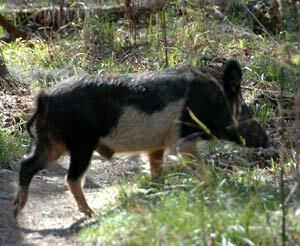 By 2008 wild pigs were documented in all 46 counties with small scattered populations in the piedmont related to recent translocation by humans. The harvest of wild pigs in 2009 was estimated at 36,888 and the estimated population in 2010 is 150,000. Wild hogs are not protected in South Carolina and there is no closed season or bag limit on private land. Downloadable information below is in the PDF or Microsoft Word format. Wild Hog Hunting – Stay Healthy on Your Hunt! The information below was taken from the Feral Hog Management in the Southeast Workshop held on August 18, 2010.